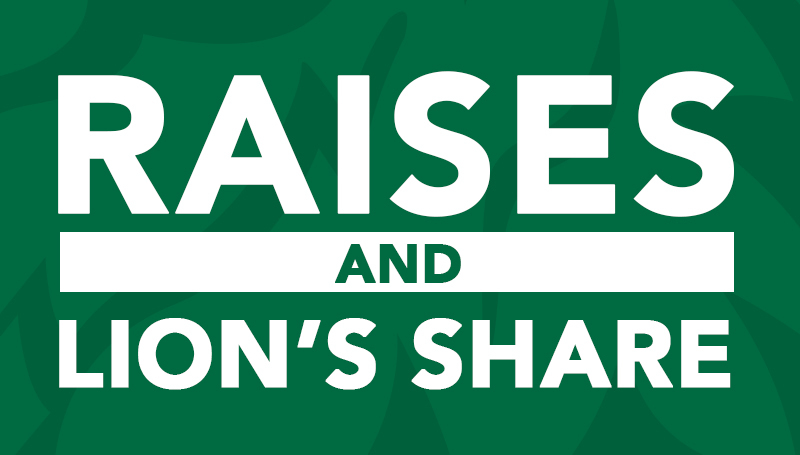 Salary increases and a new Lion’s Share distribution were announced during the September Board of Governors meeting. Board members approved a $10 an hour starting salary for hourly employees, up from $9.74. The proposed increase was an issue the Staff Senate had been championing for some time. The board also approved a salary increase of 3 percent for university employees, which will go into effect in January. Employees will also see another Lion’s Share disbursement, said Rob Yust, vice president of business affairs. “The budget ended up more favorably than anticipated due to a lot of effort by employees,” he said. “The board wanted to recognize this with another distribution. Full-time employees will receive a net check of $750, while part-time employees will receive $375. The Lion’s Share disbursement is tied to the Great Game of Education, which gives everyone on campus a vested interest in the university’s financial well-being.